Sometime last spring a new falafel shop popped up in Midwood, Brooklyn, owned by the former operators of Famous Pita on Coney Island Avenue up in Kensington. 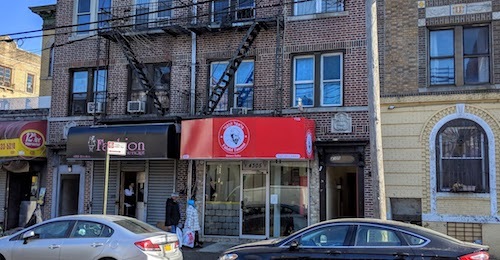 More recently, this branch has opened in the heart of Borough Park, a block away from the main shopping avenue. While I was waiting for my first taste, an orthodox man approached the small counter and exclaimed "This really reminds me of Israel!" Online reviews seem to agree, although to be honest there is not all that much in the shop. A small table carries a bunch of fresh toppings and add-ons for your pita, maybe that is the trick. While your fresh falafel balls are in the fryer, the man who constructs your sandwich will run through these and start adding as desired. Hummus, Israeli salad, fried eggplant, fries, pickles, etc... it is all included in the price. 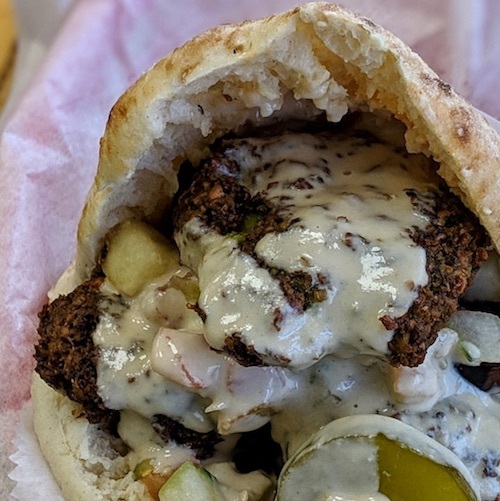 For $7, a loaded falafel pita comes your way, topped off with a good dousing of tahini sauce. The pita itself, while presumably from a package, is quite enjoyable and soft. The falafel balls remain gooey on the inside while fried to perfection and a nice crisp. None of these are sitting around and all fried on demand, ensuring a fresh sandwich. A self-serve condiment bar is available as well just in case you were too shy with the toppings when prompted. 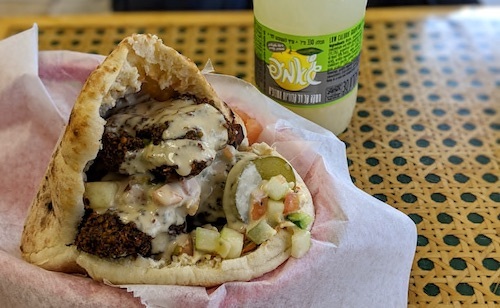 Next time back I am looking forward to trying a sabich, another sandwich within a pita that consists of slices of both fried eggplant and hard-boiled eggs. This breakfast sandwich is all the rage in Tel-Aviv these days.